Likely originating in Spain, the spaniel family of dogs have long been important companions to bird hunters around the world. As late as the 1880’s, springer and cocker spaniels were born in the same litters and were only differentiated by size after birth. Dogs under 28 pounds were considered “cockers” and were used for their ability to hunt the small wading bird known as the woodcock while the larger “springers” were used to flush game birds to be captured by trained birds of prey (which were later replaced by firearms). Separate breed status for cocker and springer spaniels was established in 1902 by the Kennel Club of England and the English springer spaniel (ESS) was formally recognized by the American Kennel Club in 1910. Since that time, the ESS has been further differentiated into the leaner and less densely haired “field” variety and the heavier boned and thicker coated show or “bench” lines. Like other breeds, along the historical path to the modern ESS, the breed has developed some inherited disease concerns that keep breeders on their toes. Luckily, some of these inherited diseases can be eliminated from blood lines though the use of genetic testing technologies and selective breeding practices. 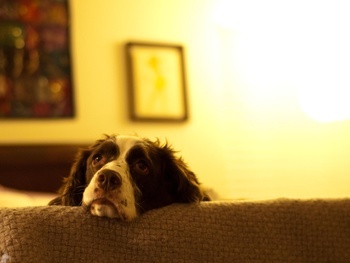 Genetic testing for one such inherited disease of the ESS known as phosphofructokinase deficiency or PFKD (also called glycogen storage disease VII) has been recommended as an optional test by the English Springer Spaniel Field Trial Association and is listed on the Canine Health Information Center website for the breed. Though the mutation associated with PFKD has been most closely associated with field varieties of the ESS, show lines have also been found to inherit this mutation. By having genetic testing for PFKD performed on breeding dogs before they are bred, dogs carrying the mutation can be identified and proper steps can be taken such that no puppies are born with PFKD. PFKD is caused by a genetic mutation in the canine PFKM gene. Dogs affected with PFKD lack adequate amounts of the enzyme phosphofructokinase (PFK), which plays an important role in the ability of muscle cells and red blood cells to use carbohydrates for energy. Dogs affected with PFKD have recurrent episodes of red blood cell rupture and skeletal muscle damage associated with periods of exercise, excitement, or stress. Affected dogs may present with signs of exercise intolerance, lethargy, pale gums secondary to anemia, and brown or red urine. Affected dogs are expected to have a relatively normal life expectancy, but will have recurrent episodes related to PFKD throughout their life. PFKD is inherited in a recessive fashion meaning that dogs must inherit two copies of the PFKM gene mutation (one from each parent) in order to develop disease. Dogs inheriting a single copy of the mutation are considered “carriers” of PFKD and will not develop disease. However, carriers can produce affected puppies if bred with another carrier of the same mutation. Therefore, in order to prevent producing affected puppies, carriers of PFKD should only be bred to dogs that have not inherited a copy of the PFKM mutation. As with most inherited diseases, it is not typically recommended to breed affected dogs. Paw Print Genetics offers testing for phosphofructokinase deficiency and 3 other inherited diseases of the ESS. If you have questions about how to eliminate PFKD from your bloodline, need pricing or ordering information, or have a general canine genetics question, please contact the Paw Print Genetics laboratory at AskUs@pawprintgenetics.com or give us a call at 509-483-5950 to speak to one of our knowledgeable veterinarians or geneticists.